Stay fresh. Avoid repeating yourself. Don’t rant. Never preach. These would be the ‘rules’ of supposedly good blogs. And, of course, doctors that dare to take a stance on health issues risk being perceived as pretentious. I get this. So it is with trepidation that I write a follow-up to last week’s CW post about right ventricular damage immediately after an extreme race effort. Notwithstanding the pompousness concern, I also wish to avoid being labeled anti-exercise. Few believe more strongly in the healing powers of exercise. But last Wednesday’s comments (both on the blog, Facebook and here on Dr. Val Jones’ BetterHealth blog) were just too good to let rest. One of my patients came to see me today with severe right knee pain. This is not a new problem, and in fact, we have been dealing with flare ups of her osteoarthritis for years. It mainly affects her knees and hands and today her right knee was swollen and felt like the “bone was rubbing together” with each step. She could hardly walk because of the pain. 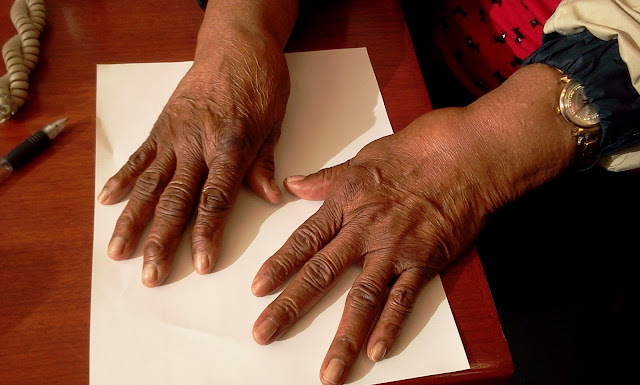 Osteoarthritis is also known as degenerative arthritis and it is one of the most common maladies of aging joints, affecting millions of people. The cartilage in joints wears down and inflammation causes the bones to build up spurs and small micro tears. It affects women more than men and the cause is unknown. There are likely genetic factors as it tends to run in families. Arthritis can occur in any joint but the most common are the fingers, wrists, hips, neck and spine and knees. Stiffness (especially in the morning) and pain are the main symptoms that limit mobility. There was important news this month on statin drugs. As one of the world’s most effective and commonly used medications, statins provide great writing topics. Lots of people have high cholesterol–including cyclists. Lots of people are interested in avoiding our mostly deadly disease. 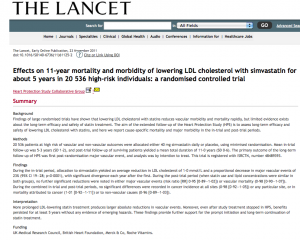 I’d like to tell you about a recently-published (Lancet) landmark study that should quell safety concerns over statin drugs. The punch line after I tell you the study’s results are short and sweet. Scroll down if you wish. But first, statin drugs are misunderstood enough to warrant a little blog-like simplicity. Let’s start with some background.